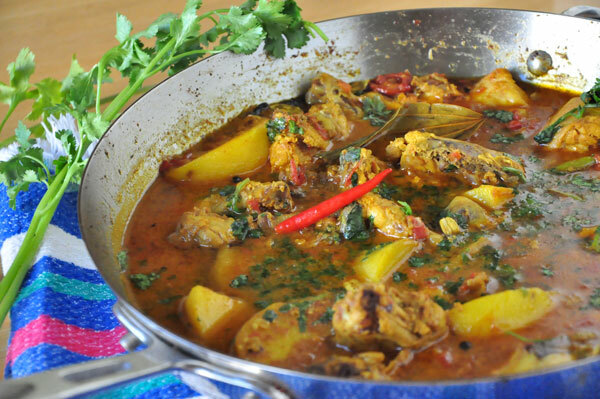 Murgir Jhol or Chicken Jhol is one of my favorite dishes. My mom’s been cooking it for our weekend dinners ever since I can remember and I know that this dish is one of the recipes that I’m going to have to keep with me forever. I’ve invited a lot of non-Indian friends over to eat and when they taste this dish, they agree with me, Murgir Jhol’s mustard oil, spices, protein and potatoes make a great curry. First, we cut and cleaned a whole Cornish chicken, and then separated it into smaller pieces. For marinating the chicken, add the lemon juice, chopped onion, ginger, garlic, red chili powder, salt and mMustard oil. Rub the mixture into the chicken well. Cover that up and set it aside for at least an hour, so that the spices have time to infuse the chicken. 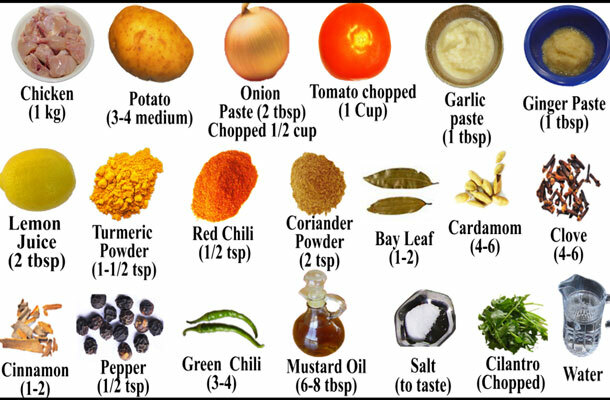 To marinate the potatoes: Add the salt, turmeric and rub them into the potatoes. To a hot pan, add 1 tablespoon of mustard oil. And when the oil’s hot, add the marinated potatoes. Fry them until they take on a brownish tinge. Then take them out and set them aside. Add 1 more tablespoon of mustard oil to the pan. Then add the chicken. Sautee the chicken until all water evaporates and you start to see the oil separate from the spices, which we call the Kosha or bhuna. When that happens and the chicken looks pretty much cooked through, take it out and set it aside for a little bit. Then add enough water until you’ve almost covered up the pieces of chicken . Add the green chilies and then the potatoes. Cover and let it boil about three minutes, then check to see if the curry is simmering. Turn off the heat. Add the cilantro for garnish. This completes the chicken jhol preparation. It takes about an hour to prepare and serves 4-6 people. We like to eat our chicken jhol with rice or chapatti.